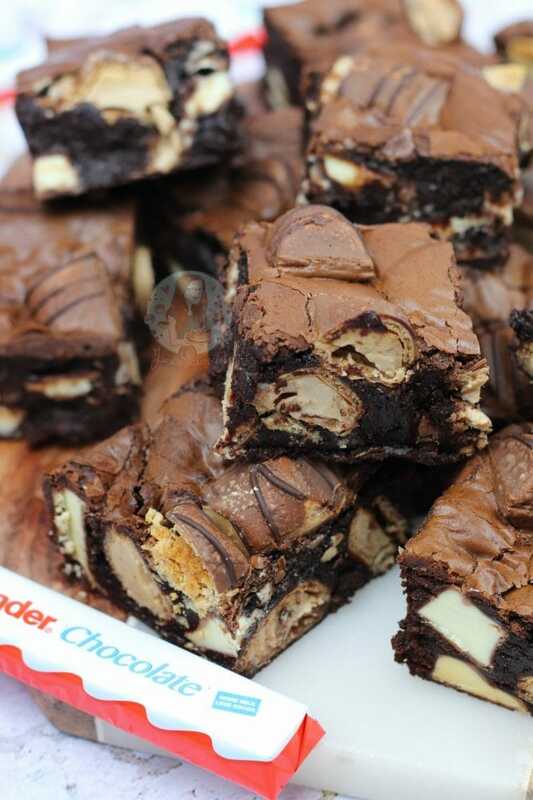 Thick, Fudgey & Gooey Chocolate Kinder Bueno Brownies with Kinder Bueno and Kinder Chocolate Chunks! Oh my YESSSSS these are the dream. I don’t usually big up my recipes myself that much because I’m always worried how they are going to be received by everyone, but these are IDEAL. Honestly I am just in shock with how much I adore these, and how well they worked. 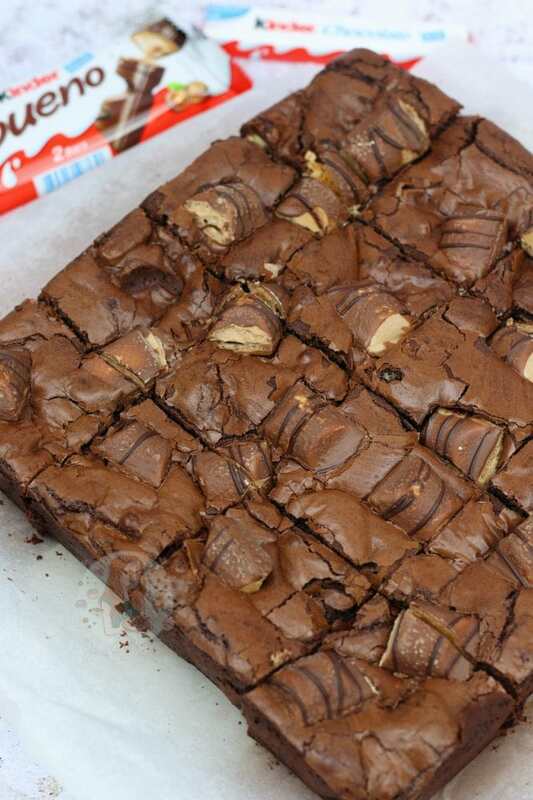 I had the Kinder Fear of when I cut into the brownies, it would all smush and break up, but LOOK HOW WELL THEY WORKED. Never had I been so satisfied! 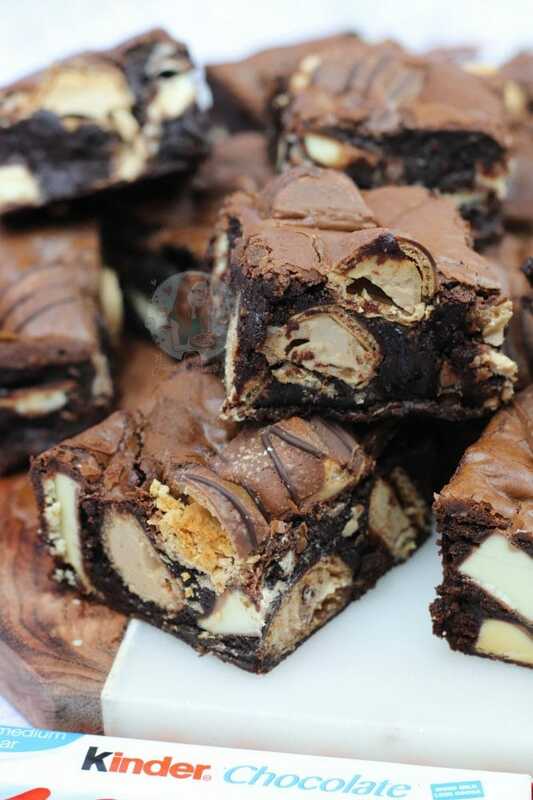 I decided that this time I would swap up the recipe ever so slightly in comparison to my other brownies such as my Triple Chocolate Brownies and Terry’s Chocolate Orange Brownies. Not too much, but enough to try something different. For example, I straight up used a completely different sugar! The Caster Sugar works completely fine, but I thought I would try and make the Brownies a slightly fudgier flavour by using the Light Brown Sugar and it was the dreeeeam. Honestly, I underestimated the difference the sugar would make in the brownies. I use Light Brown Sugar in nearly all my chocolate cupcake recipes, such as my Kinder Bueno Cupcakes, but for some reason I just didn’t use it in my brownies. But holy moly its the dream. It whisks up to a thick golden colour when whisked with the eggs, and almost seems thicker than what happens with the Caster Sugar, and thats exactly what you want. The thicker the Egg/Sugar mousse the better. I then also used a touch more plain flour, and a bit more cocoa powder to make it even thicker and fudgier and oh myyyyyyyy it was! I baked perfectly within the 25 minutes, and it then cut perfectly. I was literally astounded by how well it cut. In every slice you can see chunks of the Kinder Chocolate, and chunks of the Kinder Bueno and it just looks like Kinder Heaven in my opinion. I do often get comments on how I cut my traybakes, and I actually use a Large 26cm Chefs Knife so its long enough for the entire 9″ width of the tray, and its sharp. I do always believe that a sharp knife is easier and better to use, and its technically safer. Also, it really desperately helps when cutting through solidified chocolate such as the chunks in these brownies! 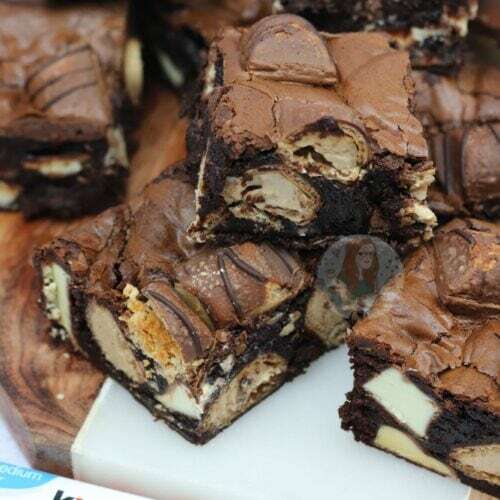 Thick, Fudgey & Gooey Chocolate Brownies with Kinder Bueno and Kinder Chocolate Chunks! Using an electric whisk/stand mixer, whisk together the Eggs & Light Brown Sugar for a few minutes until the colour has turned pale, is very mousse like, and is double the original volume of the amount of eggs + sugar! 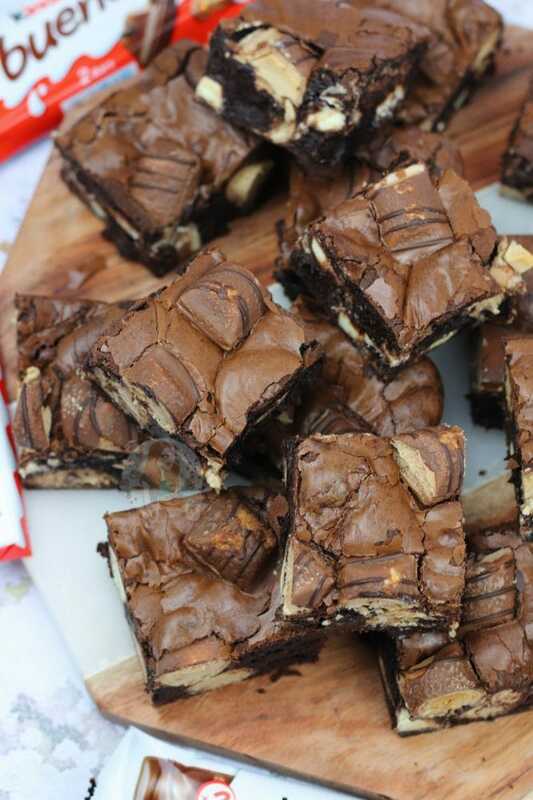 Once combined well, fold through the Kinder Chocolate pieces, and the Kinder Bueno pieces and pour into the prepared tin – bake in the oven for 25-30 minutes! Once baked, leave to cool in the tin completely, and cut into your squares! These brownies will last for up to one week in a container, but will probably be eaten before this! You can easily use another sugar in the mix, such as Caster Sugar, but I thought I'd try Light Brown Sugar this time and it was delicious! 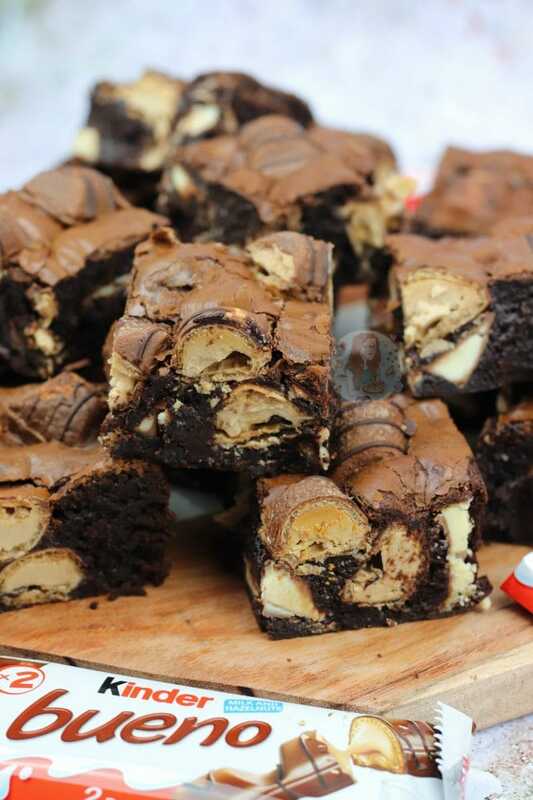 If your brownies are taking ages to cook, your mixture was probably too thin in the beginning. Cover with foil and bake for longer. If they still don't seem set after cooling, store them in the fridge and then cut so they're firmer. 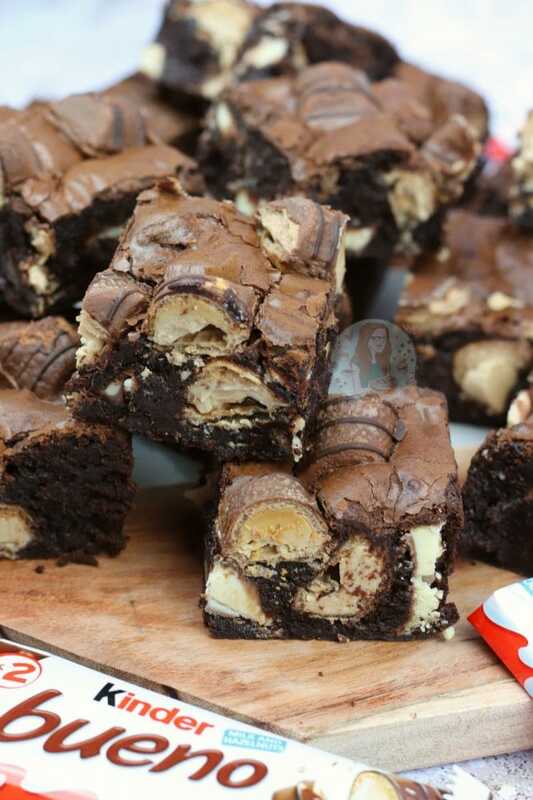 Find my other Brownie & Kinder Recipes on my Recipes Page! Older Next post: Lemon & Blueberry Cheesecake! Newer Previous post: Malteser Millionaires Shortbread! Hi i was wondering if i could use a 8 inch tin instead of a 9 inch one? You can do, but it will take longer to bake! You have some amazing recipes on here – I cannot wait to give these a try!! Thank you so much for sharing your ways with us all. Can these be made using milk choc instead of dark? No, you need to use dark chocolate for the best possible brownie. If you’re worried about it tasting ‘dark’ it won’t, it just tastes lovely and chocolatey. Hi Jane, just wondering, have you ever made these with self raising flour of other leavening agent in them? No, they don’t need it! Can’t wait to make these! Would the white Bueno bars work ok with your recipe? Hi, I attempted this recipe today. The inside would literally not cook, the outside started to burn so I had to remove from the oven. The inside was still like a mixture ? You haven’t mixed it correctly, or your oven temp is wrong. You really have to mix the egg/sugar up to a really thick mousse, and really gently fold the rest of the ingredients in because if you overmix it, it will take a really long time to bake/stay gooey. I believe the round equivalent of a 9″ square, is a 10″ round (could be wrong but I believe its about right) so might be worth trying that one first!! And thank you! Just made these delicious brownies! However, I’ve just started to cut them and the inside is still a tad gooey 😖 I left them in the oven for the allocated time, and the skewer came out clean after 35 minutes (I poked a few holes not just the centre to be certain) I was meant to be taking them to work tomorrow as a leaving gift but I don’t want to give anyone under- baked brownies! Wow! These look so yummy. I cant wait to give them a try. 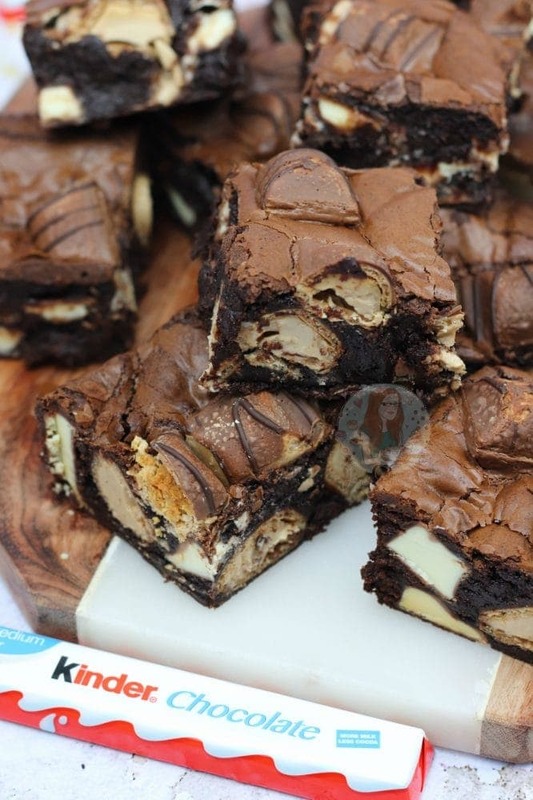 Can I please ask, do you put the Bueno pieces on the top before baking the brownie as I am always concerned that they will burn in the oven! Made these today.. the taste was amazing. I followed the recipe and baked for 30 mins took left on the side to cool but the inside was still very runny, I savoured the outside of the tin after going in the fridge but the inside of the till was too wet.. I was scared to over bake as it was my first time with brownies. Covering them with foil how long extra do you think they could need next time please? Keep producing these amazing recipes there fantastic I love seeing what’s coming next 😁. Kinder Bueno’s are my all-time favourite treat, so I’ll definitely be trying this at some point!